A Lebanese surgeon performs a plastic surgery procedure. (CNN) -- While the search for inner beauty is this month drawing Muslims to Mecca for the Hajj pilgrimage, a different kind of search -- this time for beauty of a more obvious kind -- is drawing many from the Middle East to another location. "We are very busy at this time of year -- we work like restaurants, when everyone is on vacation, we're working," Roger El Khoury, head surgeon at the Beirut Beauty Clinic, told CNN. "Every holiday period is busy; people prefer to come here during their vacations, mainly for privacy or secrecy problems." It also helps that a lot of Lebanese ladies have had cosmetic surgery. They are ambassadors for this kind of trend. The Lebanese plastic surgery industry has flourished in recent years with surgically enhanced beauty becoming increasingly desirable among image-conscious locals. Lebanon's First National Bank even offers loans of up to $5,000 for cosmetic surgery. With recent conflict troubles -- notably the 2006 war between Israel and Lebanon's Hezbollah militia -- seemingly behind it, the country is luring in more and more clients from further afield eager to take advantage of Lebanon's renowned medical experts, as well as its sandy beaches and snowy mountains. "We don't have proper statistics, so it is impossible to tell accurately, but we estimate about 20 percent of our business is people from abroad," said Sami Saad, Lebanon's representative at the International Society of Aesthetic Plastic Surgery. "We're able to make their reservations, give them right addresses and hook them up with the right doctors, because we have access and a priority with many of the doctors and hospitals," said Zeina El Haj, Image Concept's founder. El Haj said she launched her company in June 2009 with the blessing of Lebanon's tourism authorities who "loved the concept" of marketing the country's cosmetic surgery industry. Since then, she told CNN, business has boomed. "Lebanon has doctors with a worldwide reputation. When patients approach us they often ask for a doctor they have in mind. They've already done their research. "It also helps that a lot of Lebanese ladies have had (cosmetic surgery). They are ambassadors for this kind of trend," she added. "Demand has definitely been increasing. People want to look like the stars they admire -- they want the nose, or the cheeks, or the teeth of certain celebrities. They want to look good." According to El Khoury the procedure most requested by foreign clients is rhinoplasty -- nose jobs -- of which he completes about 200 per year. He says Lebanon's appeal for would-be patients is the affordability of its surgeons and its convenient location. 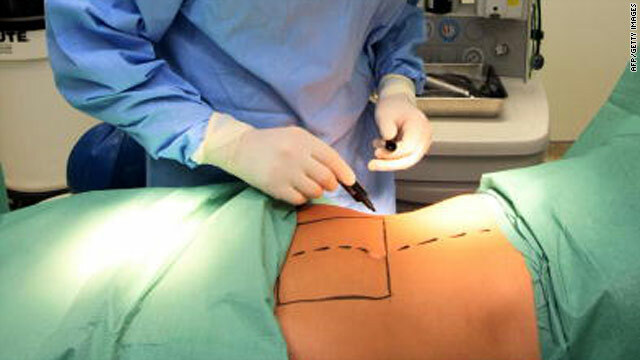 Added Saad, although Lebanon welcomed the surge in cosmetic surgery tourists, it must also warn them to be wary of unqualified surgeons trading on the country's reputation. "The society knows there are lots of people who come back to Lebanon with papers saying they've done work with certain plastic surgeons, but it doesn't mean anything if they haven't had any hands-on experience or worked officially in the operation room." "Litigation is not a very common thing here in Lebanon. It's a bit different from the United States -- there the result has a big importance in terms of litigation. In our part of the world, unless it's a major disaster due to neglect or poor experience, it's not a cause for lawsuits.